Cybill Shepherd is a famous actor who has charmed the audience worldwide with attractive looks as well as acting ability & performances. Mainly known for playing lead roles in romantic movies, Cybill Shepherd has worked with many other celebrities which have produced blockbusters romance movies. Here is the list of romantic films starring Cybill Shepherd. This is a fiercely tender, sparkly sleeper gem, with stellar cast, about spirituality, the unconditional nature of the soul mate, loyalty and love and an alternate view to death. 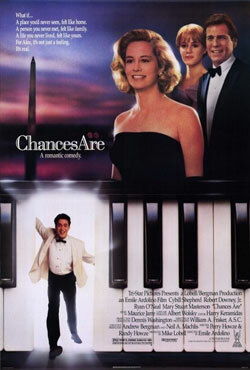 Movie Director : Emile Ardolino | Stars : Cybill Shepherd, Robert Downey Jr.